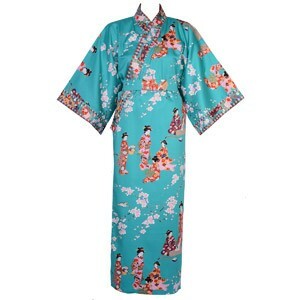 A comfortable ankle-length cotton kimono with a lady cherry blossom viewing design, ideal for wearing as dressing gown. Unlike the majority of our ladies' kimono robes the sleeves on the Beauty Kimono are attached to the gown at the underarm area. The sleeves are straight with less drop and finished with a border of complementary fabric similar to that used for the collar of the gown.